Create vehicles to allocate them to transport services on opportunities. Create vehicles in your Current RMS system to allocate them to opportunities and keep track of a vehicle’s servicing and history. A vehicle isn’t added directly to an opportunity, it’s made available for a service that you can add to an opportunity. Services let you add things like labor and transport charges to your opportunity. You might set up a service called “Transport” with a distance rate of $1.50 – that’s the price per mile/kilometer. 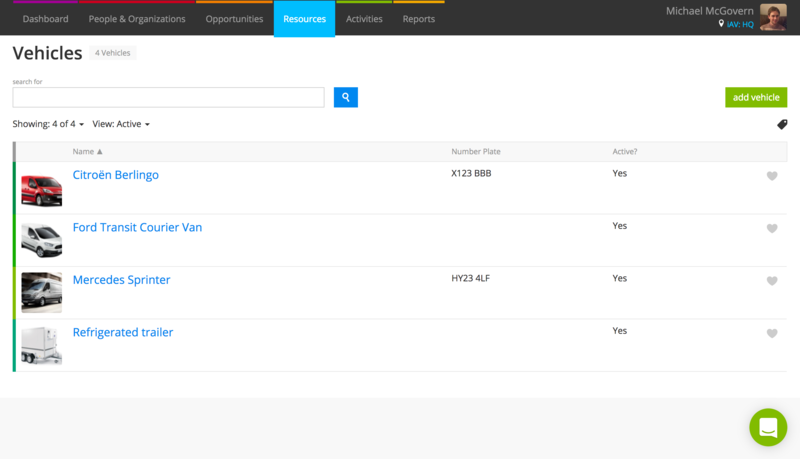 Once added, you can set up a vehicle and assign it as a “bookable resource” for that service. Then, you’ll add the service to an opportunity and can pick from a list of vehicles that you’ve set up as bookable resources. For a full overview of services and information on creating them, see: What is a service? Go to Resources > Vehicles and click the green add vehicle button at the top-right. The vehicle’s name. This doesn’t need to be unique, you can distinguish between vehicles with the same name using the number plate. Tags are a bit like smart folders or categories; they help you find and filter information. Tag your vehicle if you wish. Hit enter to lock a tag in. Any notes about this vehicle? Enter some descriptive text here that will be shown at the top of a vehicle page. Enter the vehicle registration number as found on the licence plate. You’ll see this on the Vehicles page and can use it to search for vehicles. Type in a maximum payload and maximum volume. This is just for your reference. Enter the width, height, and length of your vehicle for your reference. Setting a vehicle as inactive is a good way of keeping your Current RMS system clutter-free when you no longer use this vehicle. Make your vehicle available for services by toggling the “Bookable Resource” slider to YES. You’d want to do this if this vehicle is bookable for services in your business, i.e. if you use it for transport. Click the green add a service to choose the services they can perform and for which store they’re available. You can also select dates that the vehicle is available to and from, useful for cases when a new vehicle is being purchased or an old one is being taken out of service. Will Current RMS warn me if my vehicle is overweight? The maximum payload and maximum volume fields are just for your reference. Current RMS doesn’t weight check the total order weight against the vehicle payload.